Congrats to Joder, who won Collusion (Diversion #2) by Eden Winters! Collusion will be released on February 24 by Amber Quill Press. Congrats to Urbanista, who won Take It Off (Market Garden #2) by L.A. Witt and Aleksandr Voinov! Take It Off will be released February 25 by Riptide Publishing. Congrats to Irene, who won Something in the Way He Needs (Family #1) by Cardeno C! Something in the Way He Needs will be released on February 25 by Dreamspinner Press. Well Read is giving away a Josephine Myles backlist ebook. Not exactly sure when it closes. Eden Winters is giving away two ebook copies of Collusion (Diversion #2) and signed copies of Diversion and Collusion. Closes February 24. Kay Berrisford is giving away an ebook copy of Revelations by Julie Lynn Hayes. Closes February 25. 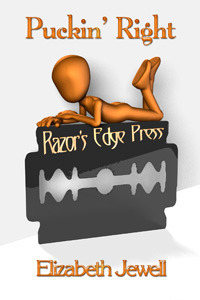 New releases and more: Literary Escapism (UF/PNR) and Fiction Vixen (romances). “Arthur Conan Doyle Estate now being sued to settle whether Sherlock Holmes is in the public domain”. A bit more about Bookish. Sloan Parker on “the essence and passion of a story”. Angela Benedetti shares her thoughts on serials at Cryselle’s Bookshelf. VacuousMinx on the far-reaching impact of that famous Twlight fanfic book. Kassa’s curious about what’s the right amount of time between books in a series. Check out Tam’s post about words she thinks need to be used more often. “A brief history of the typewriter”. The basics of how reselling ebooks might work (and why it’s not automatically illegal). Some independent booksellers are suing Amazon and it’s in part due to the popularity of the Kindle format and DRM. Dear Author on the impact of the price fixing settlement. Go download a free ebook of short stories by Neil Gaiman. Easily browse the Kindle Lending Library at Amazon. Project Gutenberg now has Dropbox synching. Was red really the most dangerous shirt color in the original Star Trek series? Can you watch 90 seconds of interspecies yawns without yawning? Tuna melts with olive oil mayo and Parmesan. Official BBC Doctor Who anniversary jewelry. Star Wars web series about the Death Star’s PR department. Amazing and fun photographs of kids. “Great moments in NHL kisses”. Gandalf and Saruman salt and pepper shakers. Mona Lisa from spools of thread. Would this annoying alarm clock survive more than a night at your house? The USPS is launching a line of clothing. Autocorrected Presidential quotations. Special US autocorrects in honor of President’s Day. 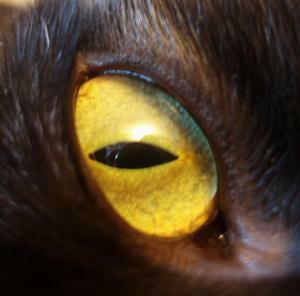 Cats have been pesky throughout the ages. Lioness and babies (thanks, Brigitte)! Baby falcon! First ever footage of wee baby tigers in the wild (via Gizmodo)! Kittens! Baby otter! Cat! Baby jaguar! Baby clouded leopards! Baby quokka! Kitten! Baby jaguars! Polar bear and baby! Baby tigers! Kitten! Baby black panther! Natural Selection by minor_hue. free online. Good short Merlin-Arthur fanfic in which Arthur’s friends think he should settle down and set him up on a series of horrific blind dates, the only good part of which is waiter Merlin. Crazy (Natural Selection #2) by minor_hue. free online. Steamy short epilogue to Natural Selection. 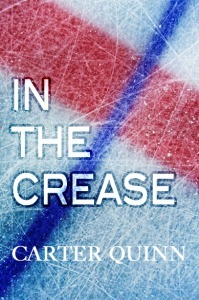 I’m Every Goalie (In the Crease #0.5) by Carter Quinn. free online. Ok short about a goalie and a d-man on opposing teams who get together every chance they have. Puck You (Puck You #1) by Elizabeth Jewell. ebook short. Ok short m/m PWP between two fictitious NHL players from opposing teams. Puck You, Two (Puck You #2) by Elizabeth Jewell. ebook short. So-so short m/m PWP between the guys from the first book. Puckin’ Right (Puck You #3) by Elizabeth Jewell. ebook short. So-so short m/m PWP in which the two hockey players are now on the same team. 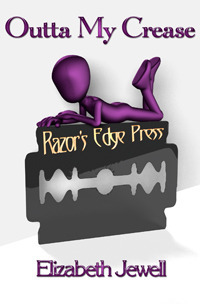 Outta My Crease (Puck You #4) by Elizabeth Jewell. ebook short. 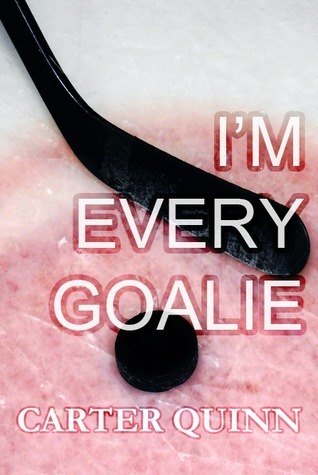 Meh short m/m PWP in which the new goalie throws a twist into things. Posted by Chris on Friday, February 22nd, 2013, at 2:00 am, and filed under Linkity linkity link, Reading, Reviewettes. 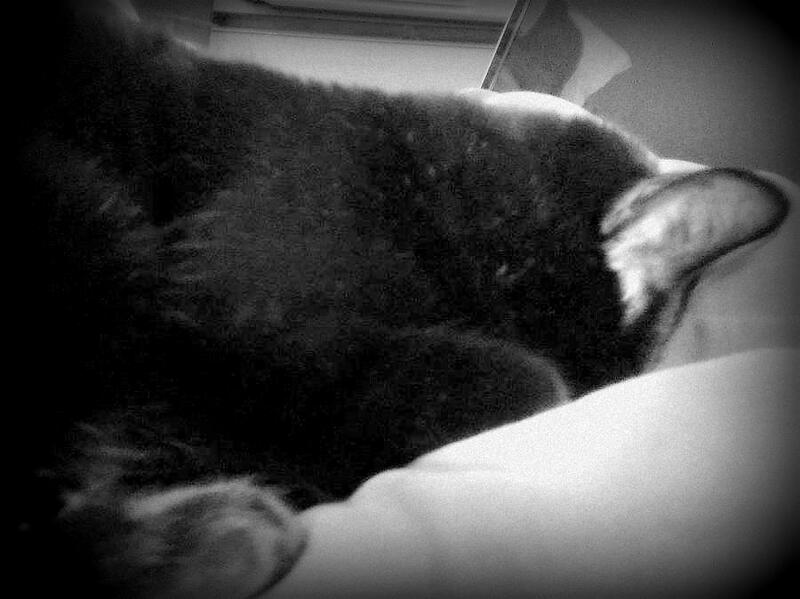 Mayhem, maybe you should sleep through Monday’s naughty boys, too. Some of those baby toys are pretty interesting, but at least one of them pegged my copyrighted pattern heebie jeebies. Makes me feel more skeptical about all the rest of them. Did you see that Nature program on crows this week? They drive me crazy but this was so interesting. Now I am really worried what they are up to! I’ve seen the kitty paw prints on the manuscript before and had to chuckle. The Lego loom is so cool and I’m looking forward to reading the Neil Gaiman stories. Okay, I have to throw this out here, because I’m hopeless like that, but why got to all the trouble of making those remarkable David Bowie dolls if they didn’t make the eyes two different colors? I think I need a TARDIS charm for my charm bracelet and Killian is insisting that the Gandalf/Sarumon salt and pepper shakers are a must-have. The what does 200 calories look like was fascinating! As was the lego loom! Thanks for the Gaiman link… and good news on the Gutenberg Dropbox integration! And once again, hours spent… But I know what we’re having for dinner. Oh, those baby lions… *sigh* I think the guys would have issues with them once they grew up though. LOL, you know I want those Gandalf and Saruman shakers. Of course the crows are up to something nefarious. Also, my sister will yawn if you merely say the word in her hearing. It’s funny. Cup holders: when we toured the auto show in 1998 to figure out what to buy to replace my 12-year-old Subaru wagon, our then-9-yo son and I sat in the back seat of every one and counted the cup holders whilst Smokey did the grownup thing with prices and motors. A recent post from kmkat..Squared out.